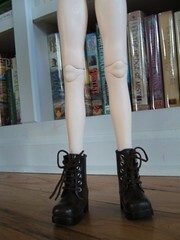 I hadn’t really thought much about collecting BJD boys, but at some point in the first few months I had Ciara, I started to really want a Lati Blue Rucas. After all, with the large family of little sisters Ciara was acquiring, it seemed like she might need a boyfriend to help keep them all in line. 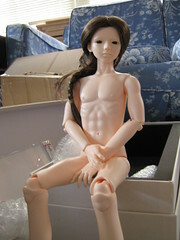 Lati Blue boys are 48cm tall–I think he was the tallest MSD boy in June of 2008 when I ordered directly from Latidoll. He’s normal skin, muscular body (as you’ll see as the pictures come out). It had come to me, at some point, that I would order him as I finished my collection of the Lati sister, and that he would come into the story by showing up at the apartments as where Ciara and Bronte lived with one of the littlest sisters who had gone missing on the trip over. Dillon arrived two months after he was ordered on August 14. On the right is a picture of him at his box opening. This is actually a wig I bought just for him, but as you can see, it was all wrong. A few weeks later, when I got around to his first faceup, he already had another bad hair choice. Honestly, though, Dillon didn’t seem too concerned about the hair issue. As he went from one wig to another, what really concerned him was the lack of pants. It really started coming to a head when they dolls were scrounging for clothes before embarking on a self-appointed house cleaning mission and Dillon couldn’t find anything big enough to fit him. He finally managed to find a pair of yellow taffeta bloomers left behind by a Madame Alexander Sleeping beauty, and had to wear those for a long time. He was not pleased. Ciara finally took over and started trying to get him some pants made. I think she was tired of all the other girls checking him out. These days, thanks to Ciara, Dillon finally has some proper pants. I’m not sure we’ll ever find the right hair. (I wonder if this is because I secretly admire the mullet and know that it’s so wrong.) He’s bigger than most other MSDs and yet his head is actually smaller. 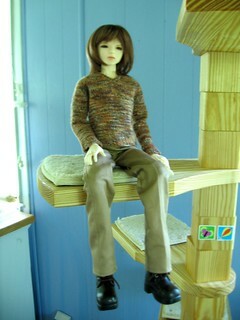 I think he’s currently wearing a size 5/6 Monique Gold Jojo in Chestnut, and 12mm brown glass eyes from Latidoll. Dillon was quiet for a long time. You could tell he noticed Ciara, but they were both painfully shy about it, and the lack of pants between them probably didn’t help matters. And where he had been amusing and good with the little kids, he suddenly started to get very broody and quiet. It was then discovered that Dillon had also left family behind when he had come to this country. But, in the chaos of whatever’s going on in that place they come from, Dillon had actually become separated from his brothers some time ago and now had no idea what had become of them. 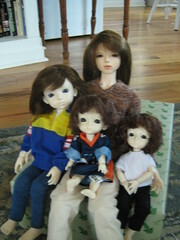 Much study of the Latidoll website was done to determine which boys were Dillon’s long-lost brothers, and then plans had to be made, and money had to be saved to bring them home. 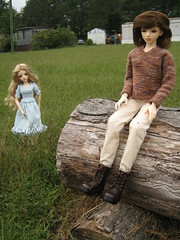 It was all very difficult for Dillon, but, with Ciara’s help, he got through it, and all the dolls were happy to welcome the three little boys in one, big, Latidoll box opening in October 2009. See more of Dillon on Flickr. This entry was posted in BJDs, Doll Profiles and tagged abjds, ball-jointed dolls, bjds, dolly delicacies, lati blue, latidoll, rucas, susan bischoff. Bookmark the permalink.